We use our wooden barstools daily. I decided that they really needed an extra level of comfort. These barstool cushions fit perfect, look great and we appreciate the extra comfort. 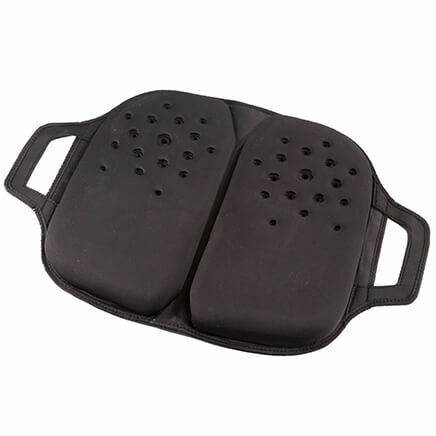 There is a gripper type material inside the cushion that prevents them from sliding. This product is great and easy to keep clean and our family love it. Love this, use it in my craft room . 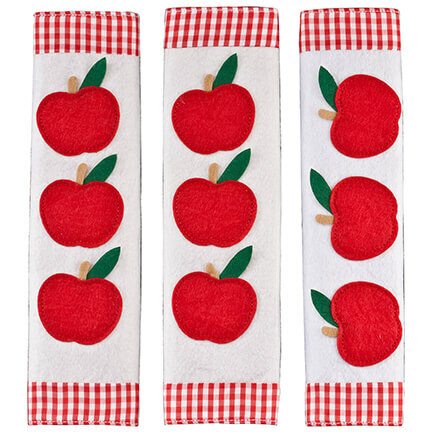 Love this item, it sure softens the seat in my craft room. Love the color and the ease of putting it onto the stool. Nice seat covers, very good quality fabric. They have a lot of foam and feel very comfortable. I got the Blue color , looks great with my beach theme. I love this purchase. 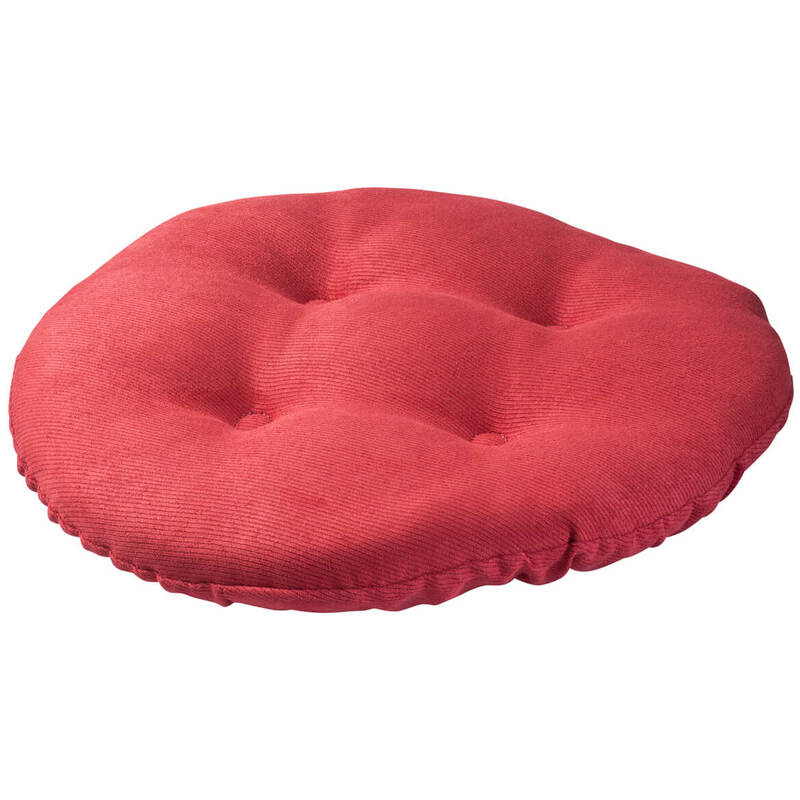 A soft comfy stool cushion to sit on when prepping food and etc. in the kitchen. Love the colorful designs to add décor to the kitchen. When it needs a clean up just remove from stool top and machine wash. Let it air dry so it don't shrink before apply to stool top. Very durable stool cover. I'm very happy with this purchase. 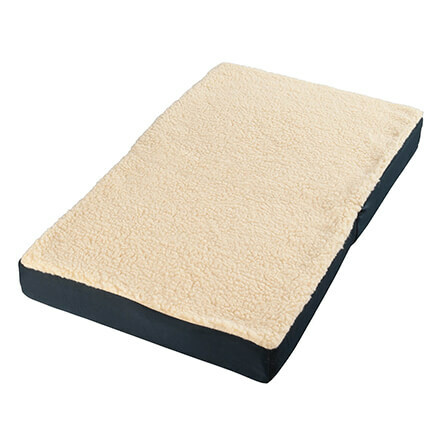 Quality Stool Cushions, Great Price! 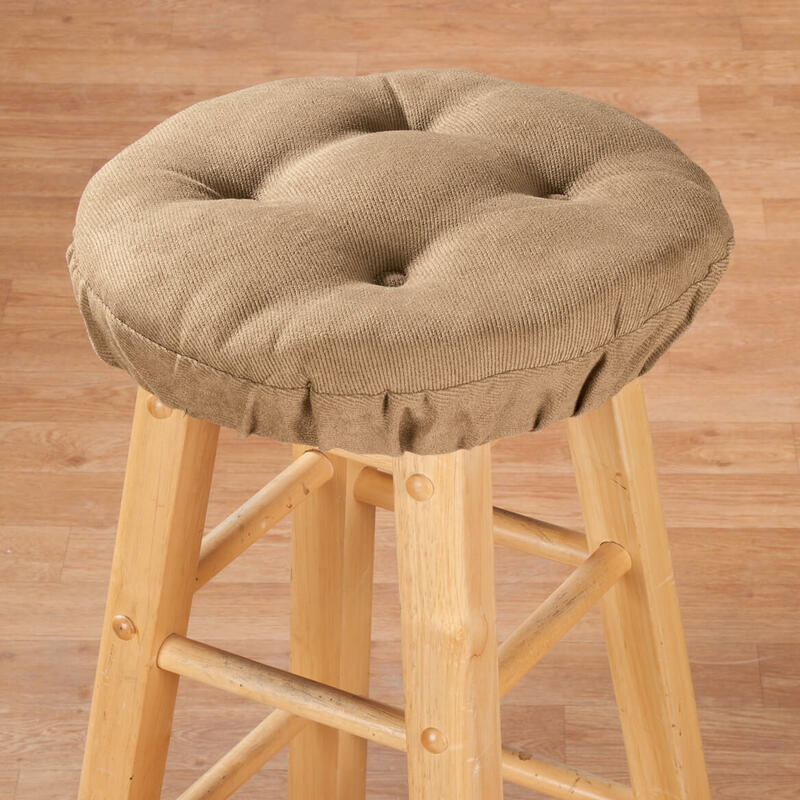 I searched the web to purchase bar stool cushions. There were many sites with different styles and prices. I chose the Twillo cushions from Miles Kimball and I am not disappointed. The cushions are of quality constuction. The color is perfect and the price could not be beat. I am very satisified with this purchase. These are great for bar stools that have hard seats. The fit is perfect. Wanna make an old stool look like new? I have an old ice cream stool whose worn out wooden seat was more than I had the carpenter skills to replace. This cushion was the answer to my quest. And it is comfortable too! Loved by my 9 yr old grand-daughter. Attractive cushion that fits perfectly on our kitchen stool. A brick red color. twillo bar stools are great just love them . every thing was perfect and got to my home before I expected it to come. GREAT JOB! will order again. I find the stool covers very comfortable and easy to put on I would recommend this to my family. Not the exact color I was hoping for, but close. Fit stools well. Spot cleaning recommended. Fabric protector spray is a good idea. Free or low cost shipping did not work for me. That site indicates you have to go there FIRST, before ordering and agree to a membership. I like the cushion and use it for my bedroom vanity chair. The color of the cushion also matches my walls and decor. These were the perfect solution to cold wooden breakfast barstools. "Grandma these make my bottom happy"
We have four kitchen stools that are harder than rocks...we bought two to try them out and will buy two more soon for others who are joining us at the breakfast table! The best part is they don't slip and slide but stay put and are nice and cushy. The web site says blue and the picture shows blue but it turns out to be gray. Hard to find that size cover you had exactly what we were looking for. Good color. Seemed to be sturdy material. Was the correct size and in stock. To cover over old bar stools. 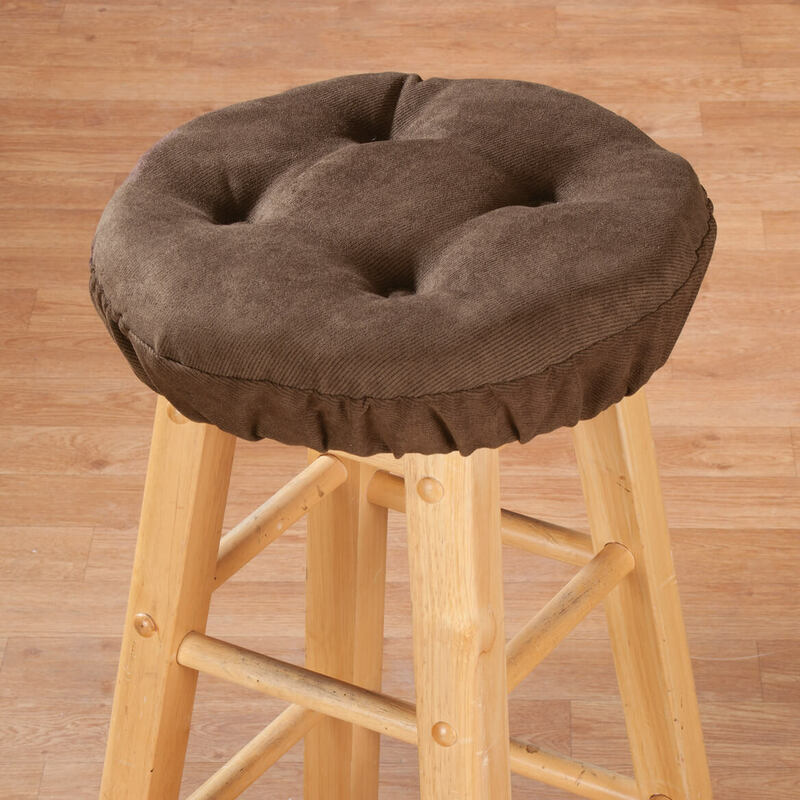 I have a wooden stool and seen this item so I could have a soft cushion while sitting on it. i needed this and you had the right color! It looked like it might work, and the price was doable. 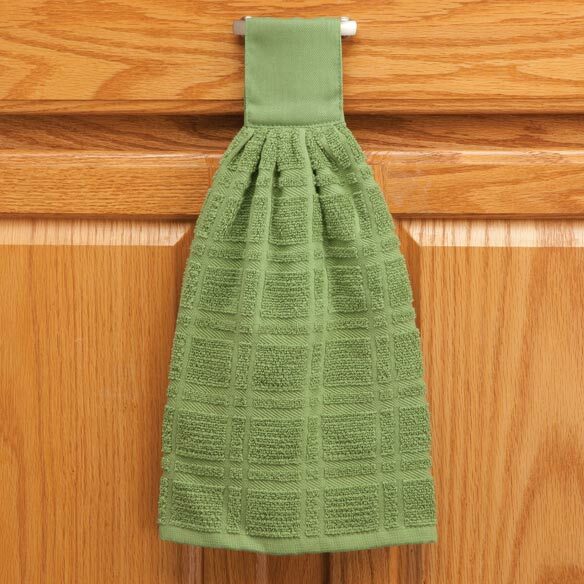 Needed for kitchen stools, liked the color. Just a guess. We'll see how they work out. I did not pick out the cushions, my wife did. 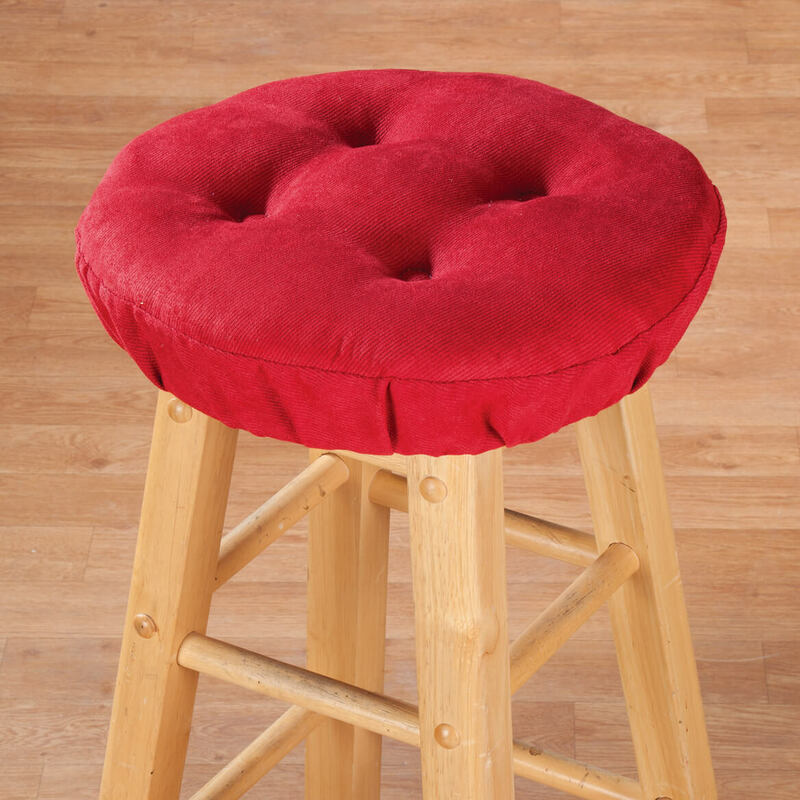 Needed a new stool cushion & this one came highly recommended in the right color. MATERIAL LOOKS DECENT AND IT IS MADE IN AMERICA!! FINALLY!! I need to cover a stool to make it more comfortable. I ordered these cushions to replace old ones that are no longer needed since we painted the kitchen...I'm hoping we love them. it was the best price I could find online and I have liked Miles Kimball merchandise in the past. This looks like the perfect solution for my son, who currently practices cello on a hard wooden stool. My bones need protection from the hard seat! I have a stool with a plastic seat. This will be more comfortable. i have ordered cushions from Miles Kimball before and was very satisfied. 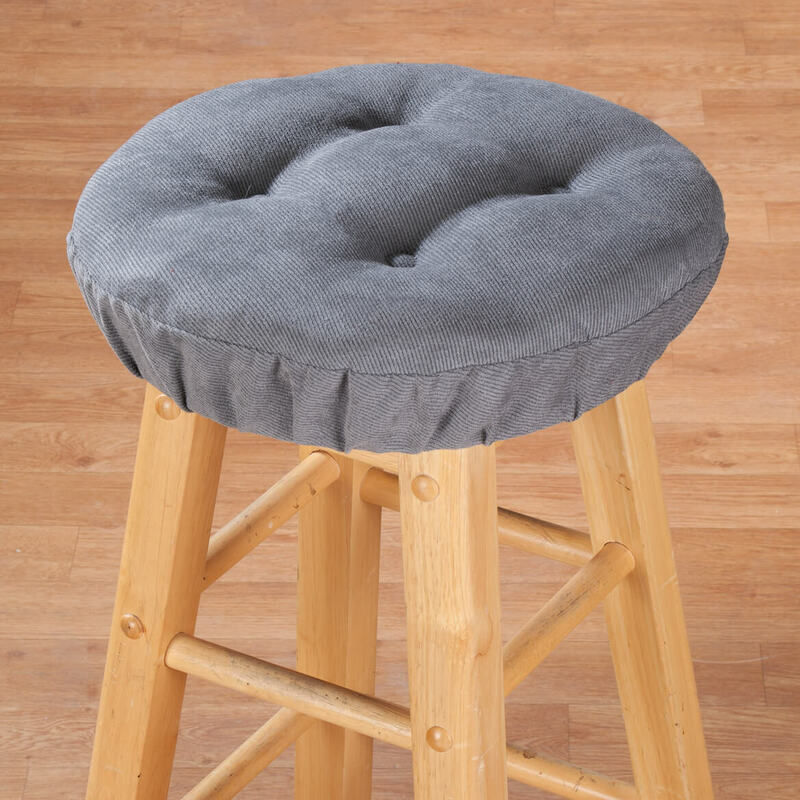 Hard to find bar stool cushions in stores. Have the burgundy one already. This one is for when the other one is being washed. right size, good reviews as to quality and comfort. Because the reviews were good. I liked how plush it is, the non skid backing, the elastic, the color options, the price, free shipping in a timely manner. The stool seat cushions look good - price is right. My stools are 12inch in diameter, will these 13 inch work ok? BEST ANSWER: My stool is 12 1/2 " and the cover fix perfect. There is elastic around bottom to keep it tight so it will not move around. i hope this will help you. My stools are 12.5 inches and they work beautifully. So yes they will work for you. Yes, your stool is the right size for any stool seat cover you choose, so enjoy. how to indicate blue color? BEST ANSWER: Thank you for your question. Click the drop down on the Select style and select blue. We hope this information will be of help to you. select blue color from "select style"
The blue is a pleasant medium blue. How thick is the cushion? BEST ANSWER: Thank you for your question. It is 2 inches high. We hope this information will be of help to you. About 2-3 inches. It is very comfortable to sit on. We have been pleased with these. Does it have a non slip bottom? BEST ANSWER: Bought this product 2 years ago, not really sure if it actually has a non slip bottom. 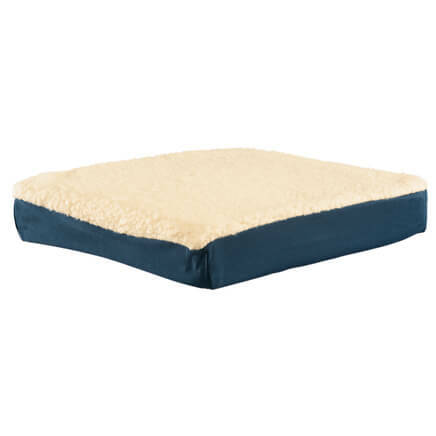 However, I can tell you this product is extremely well made between the fabric, a nice thick cushion and a strong elastic all around to hold in place. With everyday use still as good as new and never once has it come off the stool. Extremely Happy with this product. Will the dark tan color be available in the future? BEST ANSWER: Thank you for your question. Dark tan will be available after 11/8/2017. We hope this information will be of help to you. What about Light Tan? Will it be available again? 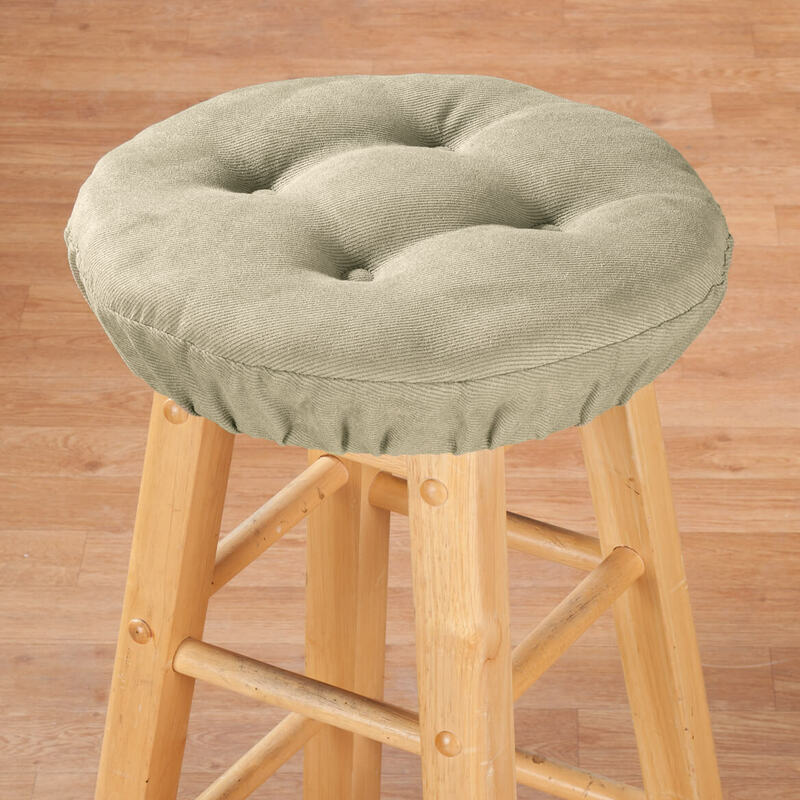 I need bar stool cushions that are 18inches do you have any that size? BEST ANSWER: Thank you for your question. Unfortunately, we do not carry any in that diameter. We hope this information will be of help to you. Does 1 order come with 1 or 2 cushions? BEST ANSWER: Thank you for your question. The cushions are sold separately. We hope this information will be of help to you. I have an old stool that is 14" in diameter. Will this cushion fit? BEST ANSWER: Thank you for your question. The cushion is made for a 13" diameter. The elastic will stretch to fit 14" but the cushion may not properly fit. We hope this information is of help to you.